Milkman Salt - Watermelon 40mg 30mLEveryone's favorite Salt flavor has been perfected by Milkman. 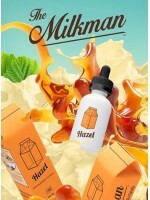 Th..
Milkman Salt - Strawberry 40mg 30mLThis sweet and tart strawberry vape will leave you wanting more. ..
Milkman Salt - Smooth 40mg 30mLShare your Heritage (get it?) with this all-time classic of vanilla, ..
Milkman Salt - Peach 40mg 30mLThe first ever Milkman flavor with peach!!! We took this long to perfe..
Milkman Salt - Mango 40mg 30mLEveryone's favorite Salt flavor has been perfected by Milkman. This ri..
Milkman Salt - Pudding 40mg 30mLOne part pudding, one part vanilla, one part lemon. All parts creamy..
Milkman Salt - Strudelhaus 40mg 30mLThe ripest and sweetest blueberries on earth at the heart of a d..
Milkman Salt - Sweet Mint 40mg 30mLA cooling and refreshing spearmint gum. The bold and cooling sens..
Milkman Salt - Milkman 40mg 30mLStrawberry Strudel Toaster Pastry + Vanilla Ice CreamThis flavor is ..
Milkman Salt - Crumbleberry 40mg 30mLRaspberries embedded in the heart of a pie topped with whipped ..
Milkman Salt - Churrios 40mg 30mLThe deliciousness that only a churro can deliver when it is mixed w..
Milkman Salt - Gold 40mg 30mLThe combination of perfectly aged tobacco here is accompanied by a bala..